Participating in the NASPA Tech Tools program that asks participants to try out Flickr by creating an account and uploading a photo. Providing some hard-to-find information about the use of a digital camera and a copy stand to copy historical documents. This is a photo of my new portable copy stand. The photo was uploaded to Flickr and it tagged with NASPATechTools; I hope others participating in the Tech Tools program will follow suit and upload some interesting photos. This device is a copy stand. I would have liked to take the photo with the camera attached to the stand but I had to use the camera to take the photo. 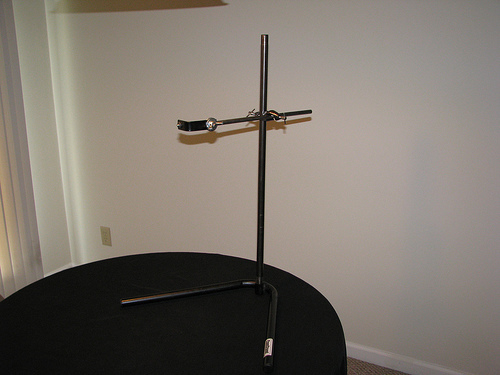 The stand that allows me to attach my new camera so the lens faces downwards. Why would I want to do that? The answer lies in the name of the stand – copy stand. I place documents on the table below the camera and take high quality photos of them. More on the specifics in a bit. But let’s ask “why would I want to do that?” again: Why would I want a portable copy stand?Â It’s so I can more easily and quickly conduct some of my current research. I have two strands of research that both focus on locating and analyzing the contents of historical documents. First, I am aiming to discover how American student affairs professionals have used and related to various technologies throughout the history of the profession. One way I’m doing that is by looking through documents in the National Student Affairs Archive at Bowling Green State University. Those documents include program guides from ACPA and NASPA conferences going back to the 1930s and other documents from those organizations related to technology. Second, I am continuing my research into student-used communications and entertainment technologies in American residence halls. To do that, I’m looking through various documents (building design specifications, housing regulations, meeting minutes, etc.) in Bowling Green’s university archives. If I didn’t have a camera or if the wonderful people at Bowling Green were not letting me use it then I would be (a) carefully poring over each document to fully ingest it, (b) taking many, many notes, and (c) asking the archives staff to copy (probably for a fee) many, many documents. By using my camera to copy documents, I can work much more quickly and, in the long run, cheaply (since I don’t have to pay for copies). I still have to read everything but I am very liberal with what I copy since it’s quick and cheap. Of course, when I say “copy” here I mean “copy for personal research use.” These documents and photos are still copyrighted so I still need to seek permission before I can use these documents for some purposes. The specific camera I am using is a Canon Powershot S5 IS. I could probably use a cheaper camera but I am very ignorant of photography. One reason I like this camera is that flash must be physically flipped up before it will work. That means that I can’t accidentally forget to turn the flash off before using it to take photos of old documents. Just as important, like many Canon cameras this one came with a USB cable and software that allows me to control the camera using my laptop. Among other things, that eliminates any possibility of me jiggling the camera when I press the button to take photos. The software also automatically sends the photos to my laptop so I can take as many as my hard drive will hold. It’s not a perfect system. First, being unable to use a flash or external lights means that I am forced to rely on the light in the room. Second, I haven’t begun to figure out all of the settings and options and I know there is some automatic setting that is fouling up the color of the document photos. That’s okay because (a) I can correct that afterwards and (b) it’s not important to get the color correct when I just want to copy a text document. The image to the right is a sample image. 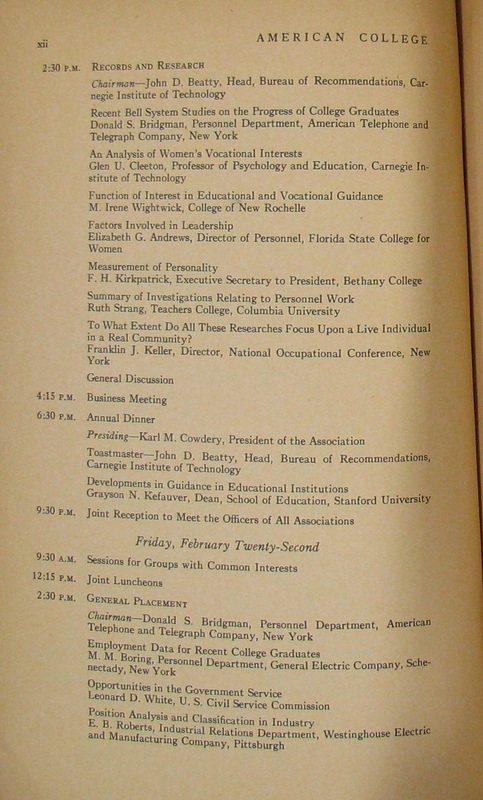 It’s a page from the Report of the Twelfth Annual Meeting of the American College Personnel Association; the meeting was held in Atlantic City on February 20-24, 1935. You can click on the image to view it full size. The only edit I made to this image was to rotate it 180 degrees and crop it. You can’t see the discoloration that I think is being introduced by some automatic setting in the software in this particular image as the pages in this book are already very yellowed with age.Â But you can see the quality of the image and how it compares to a photocopy or scan. With respect to content, this document is of interest to me because of the presentation of original research by AT&T. There are several examples in the early ACPA conferences where representatives from giant corporations – AT&T, General Electric, Westinghouse, and American Steel – gave presentations or read papers. I don’t yet know what to make of those presentations and papers. And that is part of the point: Because it was quick, easy, and cheap, I was able to copy this document so I and file it away so I can read it over in more detail later and continue to think about it and process what it might mean. Without my camera, I would have to weigh whether it would be worth the cost and time to either take very detailed notes or request this document be copied. 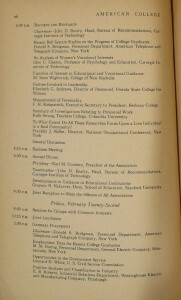 I’m finding all sorts of cool things in the National Student Affairs Archives: technology-related presentations from the early 1960s, ACPA and NASPA task forces and ad hoc organizations formed to analyze technology and dissolved within the space of a few years, and the sad story of a comprehensive student affairs information database system jointly created and funded (and then killed) by ACPA and NASPA in the early 1980s. I look forward to being able to digest all of this, make sense of it, and share it with everyone.